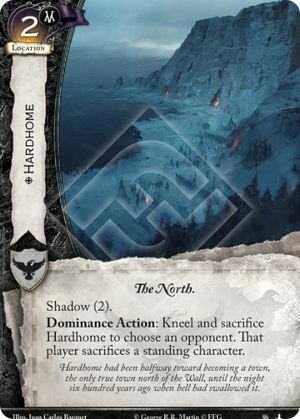 Dominance Action: Kneel and sacrifice Hardhome to choose an opponent. That player sacrifices a standing character. Hardhome had been halfway toward becoming a town, the only true town north of the Wall, until the night six hundred years ago when hell had swallowed it.